Tough "F" weight open coat resin paper discs provide aggressive cutting action. 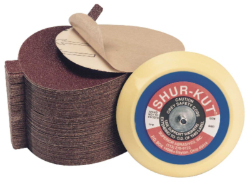 Discs in 60 grit and finer are supplied with a handy "Shur-Tab" for quick removal of the protective liner. Recommended for steel, stainless steel, fiberglass, hardwoods, and sanding operations where loading is a problem.